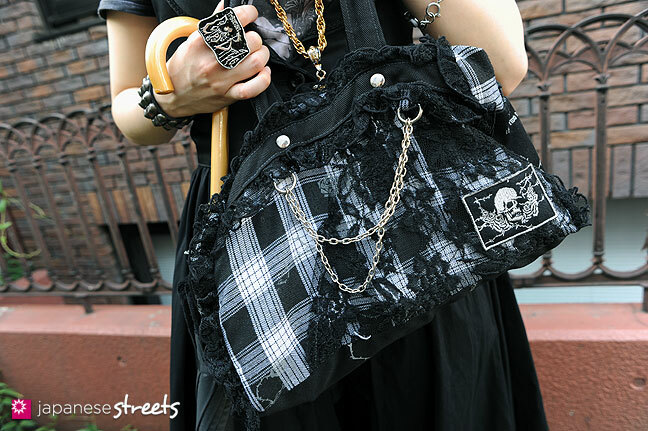 seems that vivienne westwood is a popular designer in japan, i wonder why that is. i love how natural the wig looks. 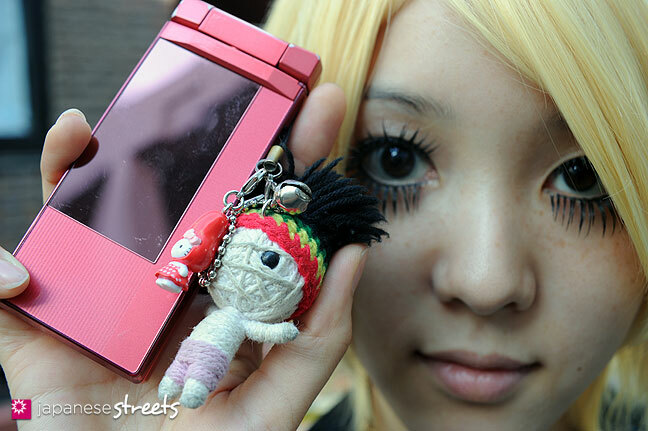 OMG to her eyelashes, they aren’t real, are they? @Animeche: Yes, I also love how Ayumi has put everything together. @sabrina: Good observation; Vivienne Westwood is incredibly popular here and has been so for as long as I can remember. 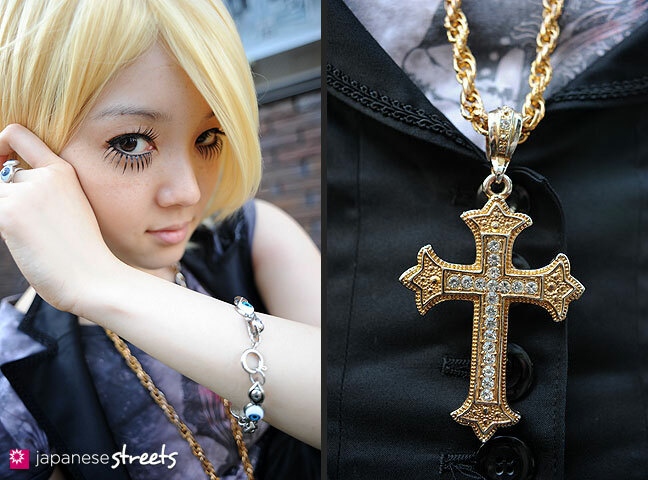 Japanese people love new things, and Westwood is usually right there on the forefront with edgy designs. @Anya: Interesting note you make. I wonder if Ayumi has read Hellsing. If so, it might have unconsciously influenced her style. @Maria: Aren’t the cellphones amazing? I spent some time in Melbourne back in 2005 and 2006 and was really surprised about the dearth of choice in cellphones. Only then did I realize that Japan was kind of unique with its amazingly wide range. That’s why we starting shooting and showing cellphones on JS. Last week, a German TV crew interviewed us and specifically asked us why we do so. I think we may be the only fashion blog that shows cellphones, or at least this consistently and obviously. I wish you’d gotten more pictures of her accessories! The bracelet and ring with eyes look cute! @Alice: You mean close-ups of just the ring and the bracelet instead of everything together like now? @Mel: We had a lot of fun coming up with that pose. That dress is so amazing, a straight stand-up would just not do. Ayumi thought so, too. 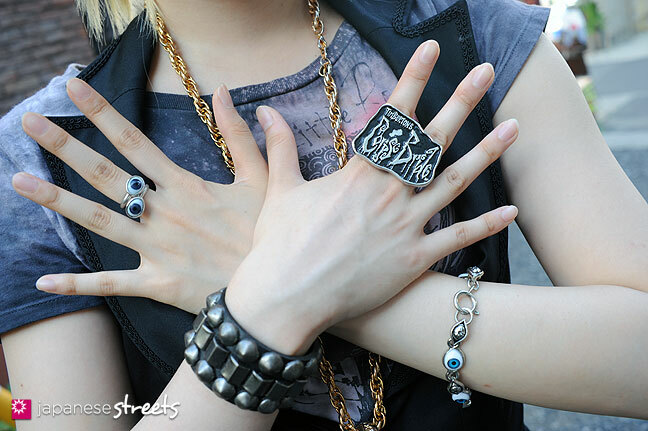 I totally agree with Alice, the eyeball ring and bracelet combo is fricken’ sweeeet. Her cute little bloomers allow the look to not be to intimidatingly goth. I’ve also noticed quite a number of parasols, which is a genius idea for this hot hot summer we’ve been having (at least in North America.. hehe). @petitesam: Japanese women are extremely careful with their skin. Women here actually spend more on skin care products than women anywhere else in the world. In spite of the fame that Yamamba, Ganguro and Center Girls got way back in the 1990s and early 2000s, almost all Japanese women desire their skin to be as white as possible. So to protect their skin and to also keep it as white as possible, many Japanese women use parasols and arm sleeves (another accessory you may have noticed). I really like the outfit, and the hair adds quite a contrast.